It was the mid-80’s when I was first introduced to tofu. A business associate and friend of my father’s would travel from Germany to San Antonio and he would stay with us. As soon as he landed, I remember he had to go to the store and load up (and I mean load up) on tofu. It was like he couldn’t be without it. The vivid sights of packages upon packages of tofu taking over our refrigerator still haunt me. I don’t recall exactly what he did with all that stuff, but I found it amazing the amount he consumed. Now that I think back, it makes better sense. He was a tall, older gentleman–perhaps in his early 60’s–and very lean. Nary an ounce of fat on him. And smart. Probably some sort of German engineer and tofu was his food of choice. Just as any good teenager would, I turned my nose up at it. If there was ever any leftover once he returned to Germany, the boxes of tofu would sit in the refrigerator until his next visit. No one would dare touch the stuff. Since that brief encounter with tofu over 20 years ago, I have dabbled in it–mostly in Chinese food. If someone makes it or if it is served in a dish in my favorite Chinese restaurant (ma po tofu, miso soup, tofu and veggies, fried tofu, etc. ), I like it, but I have never tried to cook with it at home. The truth? I was afraid of tofu. No, I did not make a Chinese stir fry or even a tofu vegetable soup. I made…are you ready for this? True. I came across the recipe while making Cowgirl Granola one night. The latest Food Network magazine is always available at my baking facility and I picked it up for a little culinary entertainment. A picture of peanut butter mousse caught my attention. 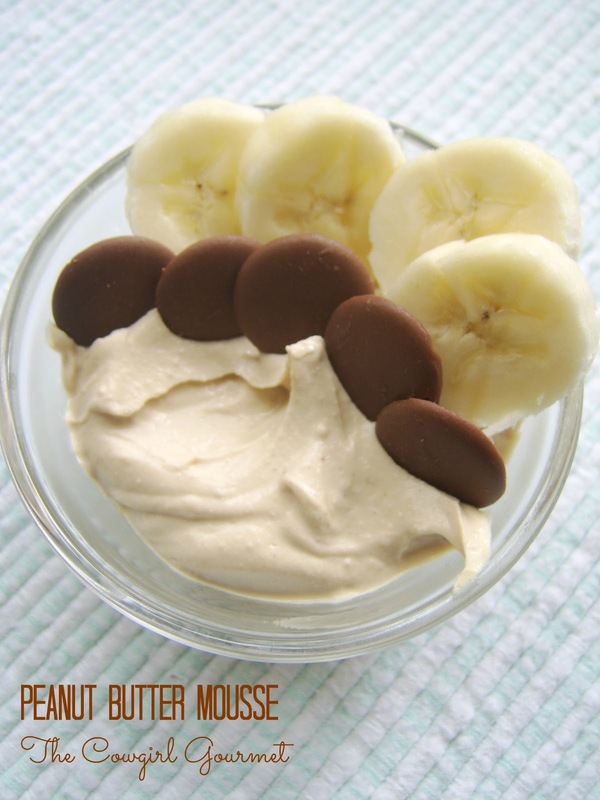 I stopped and read on because I love peanut butter and I’ve never met a mousse I didn’t like. Ingredients: tofu, peanut butter and sweetener all blended together. Really? It sounded completely bizarre, but, then again, I thought it just might work. The peanut butter changes the flavor of the bland tofu, while the sweetener makes it happy. A splash of milk adds the right amount of creaminess and a touch of vanilla brings it all together. Top that off with the fact that it’s vegan, gluten-free, grain-free, can be made sugar-free and has over 10 grams of protein per serving, and I figured it’s worth a shot, right? One of things I get the most satisfaction out of is creating a dish that you think is one thing, but it’s not. I have made cauliflower rice, banana cake and faux taters so many times because they are ridiculously divine. Call it trickery or whatever, but I am constantly amazed at the options that exist–edible options that give you satisfaction without deprivation. Truth be told, not everything that’s sweet needs to be full of butter, sugar and flour. And so it is with this peanut butter mousse. Another reason you can whip up this dessert anytime. Just be sure no one is looking over your shoulder when you make it. We’ll let the tofu be our little secret…okay? You'll never believe this peanut butter mousse is good for you and your guests will never need to know it's made with tofu. Top with sliced bananas, chocolate chips and even whipped coconut cream and watch it disappear. Place tofu in a colander and let sit for 10 minutes to drain the liquid. Crumble the tofu into the food process and add peanut butter, milk, sweetener and vanilla to the food processor and blend until thoroughly combined and creamy, about a minute or two. Spoon mousse into four ramekins or other individual serving dishes, cover with plastic wrap and refrigerate for an hour or more. When ready to serve, add a few slices of banana and top with a sprinkling of chocolate chips or discs. Whipped coconut cream would also be a welcome addition. Erica, you should try this. It's delicious, easy and good for you.